3DLT was recently invited to present at The Dark Horse Competition. The event took place last Friday at the Plug and Play Tech Center in Silicon Valley. Attendees heard keynotes from prominent Chinese and US investors, and pitches from twelve Chinese startups, who were there to compete against twelve American startups, including 3DLT. While Dark Horse is well known as one of China’s top business competitions, this was the first time it has been held in the United States. Dark Horse was started by The Founder Magazine, a well-known Chinese media outlet focused on entrepreneurism. Niu Wenwen, President and founder of Founder Media, started the company to provide a resource for China’s growing startup community. 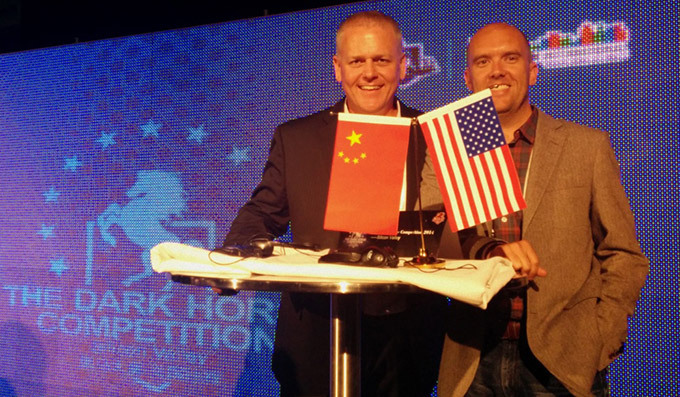 Less than two months ago, the decision was made to host a Dark Horse Competition in the USA. A significant effort went into planning the event so quickly. Given it’s history and prominence in Silicon Valley, The Plug and Play Tech Center was the perfect backdrop. It has accelerated thousands of startups and produced several significant exits. At one time, or another, some of the Valley’s most successful companies including Google, PayPal, and DropBox have worked there. Beyond location, the competition had to overcome many other logistical hurdles, not the least of which involved selecting the teams and arranging the trip. Here in the US, most of the companies selected were from the West Coast. 3DLT was introduced to the event by Jami Edelheit, the owner of Greenfield Capital and organizer of TedX Cincinnati and TedX Onboard. She had worked with the Chinese group previously and heard that a final US team was needed. She recommended 3DLT and less than two weeks before the conference we received the official invite, making us the darkest horse in the field. Upon receiving the invitation our team went to work, refining our pitch for the audience and determining who would attend. 3DLT investor and board member Brad Zapp, quickly agreed to go. He worked tirelessly to ensure we had all the right resources, even working with the Cincinnati Chinese Chamber of Commerce to secure a translator for our team. We arrived the night before the event and were invited to dinner with the Chinese delegation. We met many new people and greatly enjoyed the conversation (thanks to our translator, Diana Huo and Dan Stephenson, one of the event’s American organizers). Even with different languages and cultures, it was obvious that night, that globally, entrepreneurs share many of the same barriers and opportunities. The event itself was first rate. Our hosts were well organized and few details were missed. The keynotes were insightful and thought provoking. Shark Tank’s Kevin Harrington and Stacy Sun (CEO of Pansuns) emcee’d and both were excellent. With 24 teams presenting, it was a long day, but it was so well organized that we were rarely off schedule. 3DLT was scheduled to pitch eleventh. We took the stage early in the afternoon. With all of the lights onstage it can sometimes be difficult to gauge a crowd’s reaction, but from the questions we were asked, I thought it went well. Each team was judged on several criteria. We finished in the middle of the pack and overall, the US teams won by a nose (pardon the horse pun). 3DLT had two goals for the event. First, we wanted to share our story with the investors who attended. Many were interested in what we’re doing and wanted to talk further. Our second goal was to gain access to the Chinese market. In-roads were made there as well. Mission accomplished! I’d like to close by recognizing the people who made our appearance possible. Jami and Dan, thanks again for inviting us. Evan Brooks at the Cincinnati Chinese Chamber, thank you for recognizing that this event was as big for our region as it was for 3DLT, and for providing your support. To Tom Prewitt, thanks for letting us bring your son Baker. His help was invaluable. To Brad Zapp, thanks for your unending confidence and support. We’re grateful for all you do. Finally, I’d like to thank Mr. Niu Wenwen, CEO of The Founder Magazine. Your hospitality was incredible. You’ve been an inspiration to countless number of Chinese startups, and now you can add at least one US firm to that illustrious group. If we’re ever in a position to repay the favor or help in any way, please don’t hesitate to let us know. I’d also like to invite you to publish this article in your magazine. Hopefully your audience will enjoy reading about how tirelessly you’re working to improve startup life, both at home and abroad. We are Dark Horses (HeiMa), we will win!